It is quite undeniable that flowers have become a significant part of human life. Blooms are ever present in special occasions, celebrations, and even in times of grief and bereavement. Many of these events may even associate themselves with a specific kind or particular set of blooms. Hence we learn that blooms, are not merely for decoration, as you’ll see with our flowers that start with U, but they also carry profound meaning and unspoken messages. It’s no wonder that interest in horticulture has always been present if not steadily rising. Also, careers or hobbies in gardening or floristry are almost always in demand. Blooms are at the very center if this work. You can even say the flowers are the very heart of every garden. 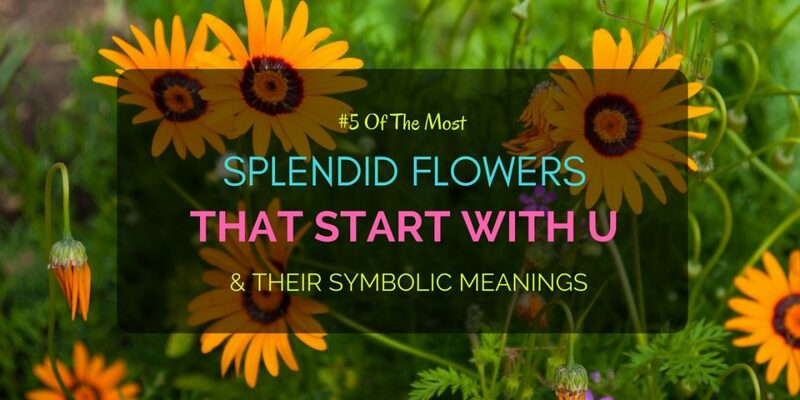 Take a look at this five flowers that start with U, and you’ll understand why. Native to the Irish landscape, the ulex plant or gorse emits a sweet aroma reminiscent of coconut! And when these plants bloom in profusion, their beautifulrich yellow flowers are indeed a sight to behold! Also, you would not have to wait to long for this lovely view as Ulex plants bloom all year round. Also, you’ll find gorse flowers and shoots in tea making and salads! The bright yellow of the ulex flower symbolizes joy and celebration and though dark days may at times come there will always be light,andUlex will always bloom. You’ll understand the reason for its common name as soon as you see the spreading foliage of the Umbrella magnolia. Its large leaves seem to resemble an open umbrella. However, the main feature of this perennial is not its “umbrella” but its “tripetala,” referring to its flowers’ three large sepals. These snowy blooms sit atop the plant's umbrella-like leaves in all its glory. The creamy white blooms of the Magnoilatripetala represent protection and the goodness found in all things. The delicate and sweet-smelling blooms of the Upright Virgin’s bower (or simply Virgin’s bower) resemble tiny stars with their abundant long stamens. You could enrich both your garden’s looks and aromas with this lovely perennial but do note its rampant growth which may take over your other plants! This climbing vine spreads quick and aggressive, earning in the meaning of passion and undying devotion. The Uva-Ursi, or bearberry as many people call it, bloom delicate bell-shaped flowers in shades of white and pink. As to its name, the bearberry is as called as many hunters and observers note bears are waking from hibernation and feasting on this flowering plant. What’s more, you’d see bearberry in therapeutic applications as a treatment for urinary tract disorders. The blooms of the Uva-ursi may represent strength and fortitude. Floriferous is a perfect description of the Ursinia plant since it blooms its yellow and orange flowers in abundance! Hence, for guaranteed flowers to feast your eyes upon, consider the Ursinia plant for your garden. They are ideal as border plants. Also, they require little water and are tolerant of heat. The Ursinia is a profound symbol of good gifts, and how the giving of love and happiness serves to multiply these emotions two-fold.